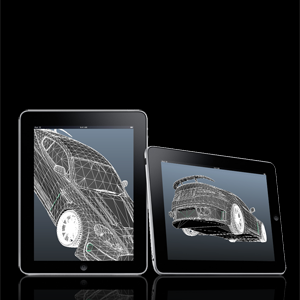 This software makes it possible to display, interact with, and dynamically deliver 3D models to iOS (iPad) and OSX devices. With these tools, non-programmers gain the capability of delivering 3D models to user devices dynamically through a simple content management system (CMS), much in the way websites are updated. This means that long after an app is living on a user's device, a model can be updated or changed entirely. The CMS also makes it possible to control how the model is presented. Without programming skills or knowledge of OpenGL, a user can adjust the textures, 3D lighting, some properties of the simulated physics, zoom level, and rotations on the X, Y and Z axes. They can also add text and graphical overlays and X/Y/Z location-aware labels that can follow the model as it travels through the 3D environment. All of this is possible via the CMS and all of it can be delivered dynamically even after users have your app on their device. Once the software is integrated into a workflow, the app developer is freed to focus on code and the designer or editor can iterate and test rapidly. Contact us for a demo. This product is in use in various commercial products such as Display Builder.